Alternate to conventional heating & cooling system Scanair Air Source Heat Pumps have proved to be the most cost effective energy saving systems the country wide. 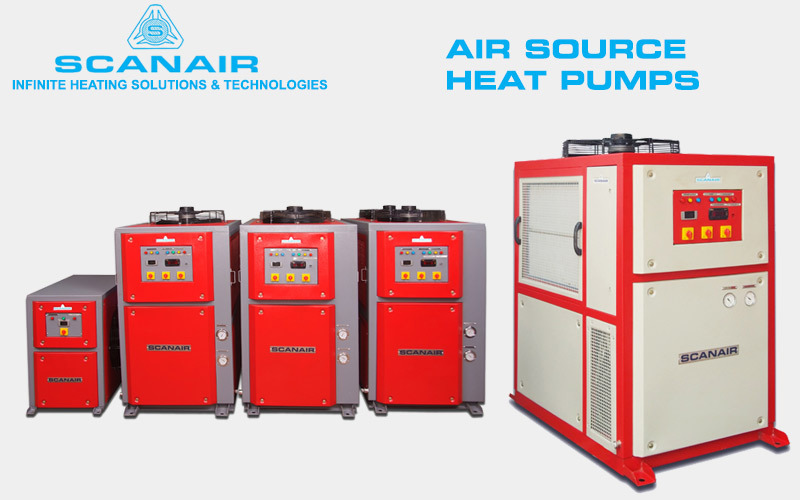 Scanair air source heat pumps will maintain the temperature range from 24°C To + 80° C ± 2° C, capacity from 3 Kw to 150 Kw from 10 Lpm to 300 Lpm with different from capacity. Easy and practical to open side panels for servicing each plumbing, refrigeration accessories, electrical accessories. Compressors incorporate in a variety of safeguards that ensure durability including an internal pressure relief valve, motor temperature protections superior oil management functionality. These heats pumps are ozone friendly, packaged type have been designed for many years of trouble free operation. Scanair air source heat pumps are ideal and most suitable for a wide spectrum of applications in industries like Swimming Pool, Household water heating, commercial building water heating, industrial application preheating, for Seed Drying, Food, Pharmaceutical powder drying ,Laundry Drying, Latex Drying, Ceramic Drying, Mattress Drying, Paint Shop Drying, Tumble Drier, Fish Drying, Spices Drying, Mango Drying, Dhal Drying, Meat Drying, Fruits/Vegetable Drying, Tea Leaves Drying, Herbal Drying, Turmeric Drying, applications etc. Air source Heat Pump water heater is built on a new power-saving technology, which regard as the fourth-generation water heater. Heat pump water heater makes use of the cycle principle, absorbing outside heat from the atmosphere air with the processing of compressor and refrigeration liquid, transmitting the heat to produce hot water. Heat Pump is a machine or device that effectively “moves” thermal energy from one location called the “source,” which is at a lower temperature, to another location called the “sink” or “heat sink”, which is at a higher temperature. A heat pump is an electrical device that extracts heat from one place and transfers it to another. The heat pump is not a new technology it has been used in India and around the world for decades. Refrigerators and air conditioners are both common examples of this technology. Heat pumps transfer heat by circulating a substance called a refrigerant through the cycle of evaporation and condensation. The compressor pumps the refrigerant between two heat ex-changer coils. In one coil, the refrigerant is evaporated at low pressure and absorbs heat from its surroundings. The refrigerant is then compressed to the other coil, where it condenses at high pressure. At this point, it releases the heat it absorbed earlier in the cycle. Many industries need warm process water in the temperature range from 40-90ºC, and often have a significant hot water demand in the same temperature range for Laundry washing, sanitation and cleaning purposes. This can be achieved with Scanair Air Source Heat Pump Systems are installed. Heat pumps can be a part of an integrated system that provides both cooling and heating. 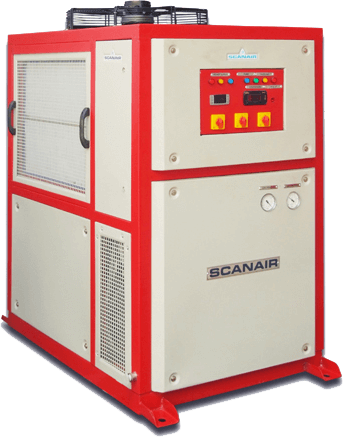 Scanair Air Source Heat Pump Systems are used extensively in industrial dehumidification and drying processes at low and moderate temperatures (between 20 ºC to 80 ºC). The main applications are drying of pulp and paper, various food products wood and lumber. Drying of temperature-sensitive products is also possible with it. Heat pump dryers generally have high performance COP 5to7, and often improve the quality of the dried products as compared with traditional drying methods. Because the drying process is executed in a closed loop system, safe odors spared outside from the drying of food products etc. are reduced. Both closed-cycle compression heat pumps and cascade systems are implemented.